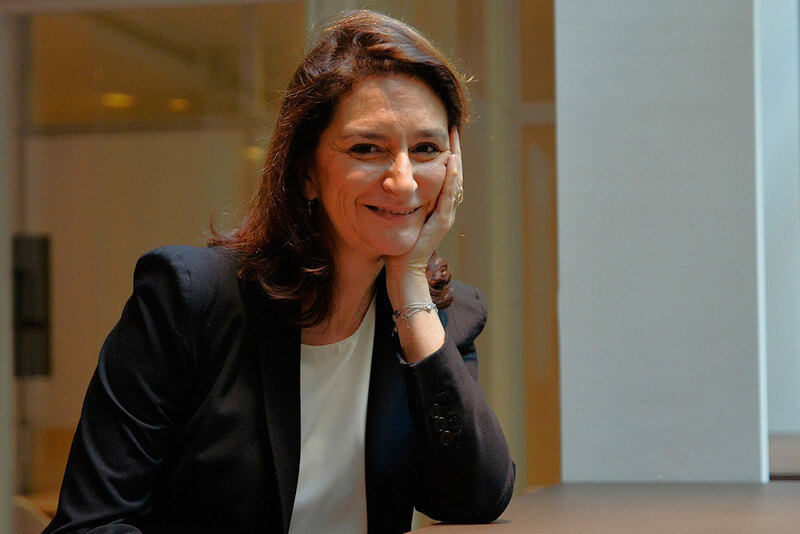 Alessandra Perrazzelli, 54, country manager of Barclays Italy; she has a law degree and a Masters in corporate law, corporate finance, financial services’ law and regulations. I start digging into her habits and I discover that her work day begins at dawn with an hour of physical exercise and care of the home, breakfast with her two teenage kids, then she reads the news, mail, emails and whatever necessary to get to the office and already be up to speed and updated on everything. I ask if she has any regular appointments. Two mornings each week dedicated to networking breakfast with professionals preferably that have nothing to do with her world. The primary rule in the office is to have an open door: “I allow my collaborators to come and go as they please so that they can talk about anything they need to. This obviously is when I’m not traveling, therefore in reality not very often!” she admits with a warm laughter. CIn such a perfect and balanced ecosystem, obviously, there is no room for glitches, but also for this Alessandra has an answer and a solution: “I learned to let them happen,” she says proudly. I look at her as if an oracle were on the verge of revealing the truth: I ask her how she does it. She answers very simply: “you always have to expect something unexpected to happen. That way when it does happen, you’re ready; you had already factored it in: this allows the mind to open up to the revolution!”. She says that nothing works better than resting, doing sports and taking the phone off the hook to improve productivity and performance: “with timing that is always very tight, productivity inevitably decreases; it is essential to create space for oneself in order to always have fresh energy”. It is fundamental to always share and speak about projects with people you are close to, to study and do a lot of research, to have an open mind: these are the main points of her guideline for success. Innovation in the field of medicine and scientific research is what she thinks will change the world in the near future. However, she believes that a necessary revolution would be how to conceive the duo woman and power, abandoning old clichés. It’s certainly a matter that touches her closely, being a woman and a boss, in Italy, in a sector, the financial one, which in the collective imagination is a men’s world. “Men are extremely competitive, they try to stab each other in the back and naturally the try to do it also with me: I think it’s a clear game and I’m not afraid of playing,”, she says with a look that is serene but at the same time firm. “It is necessary to create greater conditions for women to compete, but even more fundamental is that women believe in it. When I joined Barclays we were only two women. Today I can say that my management committee is 50% young men and 50% influential women: I am very proud of this”. Her favourite city is New York; she was born in Genoa but then she was reborn in the Big Apple living it first as a young student and then as a professional. “It’s a city that is constantly on the move, extremely inclusive; full of differences but with one common spirit, where one breathes art, culture, business and convergence”. There she met Brooke V. Mahoney, a special woman who was a source of great inspiration for her. Alessandra describes their first meeting in every single detail: a cocktail party at the home of Alessandra’s uncle, the lights of New York in the background, a woman stands out in the crowd: Brooke. She’s extremely elegant and sophisticated in her green dress, nails with red polish matching her lips; she stands her ground with a natural grace. “It was impossible not to notice her: she was extraordinarily handsome, classy, intelligent and nice. I could have gone on watching her for hours. It was then that I thought that I wanted to be like her”. From that moment on a solid and lasting relationship between the two began. “Brooke accompanied me in all phases of my life; she taught me a lot, she helped me grow making me understand that I could reach all the objectives that I wanted without giving up my femininity and my private life; she was very strong role model. In her honour I named my daughter Margherita Brooke”. Just like any person from Liguria she could never give up the sea, even just watching the waves break relaxes her. Woe to anyone who takes away her keychain, a present from her mother, full of good luck charms that hang along with the keys to the house, symbol of the most important place for her. She loves being surrounded by people she loves, with whom she shared the profound journey of life, who represent for her “an endless source of energy”. She doesn’t just love people; she also loves being surrounded by things, especially those from the past, which she brings back to life in her present. She tells us about her house in Liguria, where she was born, full of memories like her father’s cradle that then became of her children and much, much more. Her home in Milan is full of books, music and instruments. Music is another of the key elements of her life: both she and her kids play an instrument and Alessandra also takes delight in singing. A “woman of multifarious talent”, as Homer would have said. However nothing beats her passion for shoes, exclusively heels, the accessory from which she begins to decide her look. She loves the eccentric ones even though she cannot always afford to wear them, since she has to look reassuring because of her role. To relax at the end of a day she cooks; she likes to prepare dinner, take care of the dinner table and eat by candle-light: “it’s an important moment of reunification; when you are finally unharnessed.” The atmosphere that reflects her personality is the one that she creates; she loves collecting modern antiques, but she hates standardization of styles; she likes tearing them apart by inserting some isolated elements that give a personal touch. “It is my interest for multiculturalism that determines my passion for contamination, both at home with particular objects or at work, building the most relationships possible with people far away from me or different from me. Contamination allows me to put together the worlds, the realities where I lived: “you could say I love fusion, from many points of view”.